Due to it’s glacial influence, the Flathead is not known for it’s prolific insect life. It does get all of the western freestone insect hatches but slightly muted in numbers. The most note worthy hatches are probably caddis and PMDs in July, although hatches of less magnitude get plenty of attention from fish. Terrestrial fishing is king on this river. Ants, beetles, and hoppers come into play early here and reign supreme well into the fall. Small #16 – #18 sparkly ants are one of our favorite. Various color #12 – #16 attractors and foam variations are also great most of the year. Chubby chernobyls, PMXs, stimulators, and purple haze mayflies are our best selling flies for this river. This information is a basic run-down of the hatch schedule for the Flathead River. Every Year is slightly different. 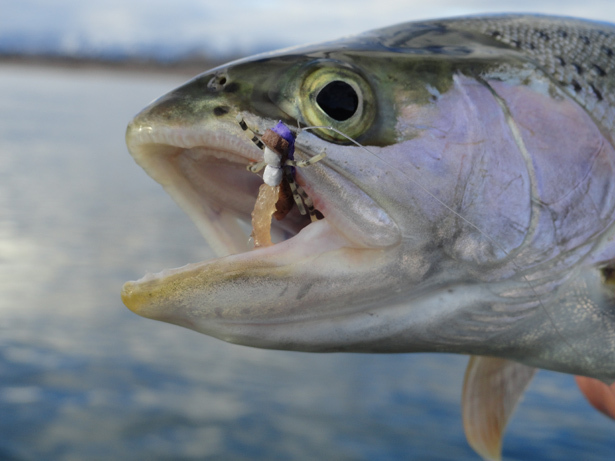 Snow-pack, run-off, and weather conditions can alter the hatch times considerably. There are dozens of commercial nymph and dry fly patterns available for each individual insect. Although we tie a lot of our own flies, we have listed a few basic patterns that will help give you direction when purchasing or tying your own. Images in bottom row provided by Troutnut. Visit Troutnuts website to learn more about all of our insects.